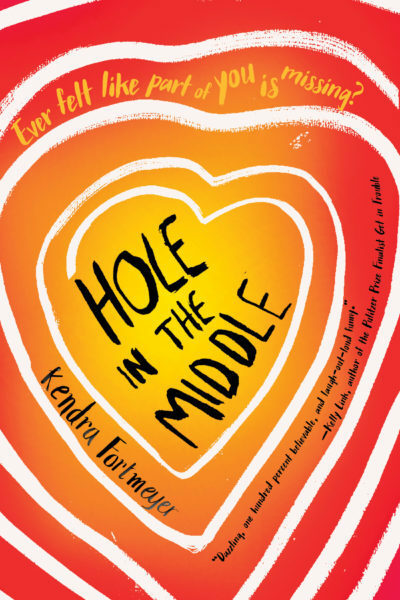 Kendra Fortmeyer is one of Soho Teen’s newest rockstars and her debut novel, Hole in the Middle, is coming out in September. We asked Kendra to answer some (admittedly) average questions about her book. We are most pleased to report that she delivered some well-above-average answers in return. Have you ever felt like a piece of you is missing – and like that missing piece makes you somehow different from everyone else, makes you weird and unlovable? 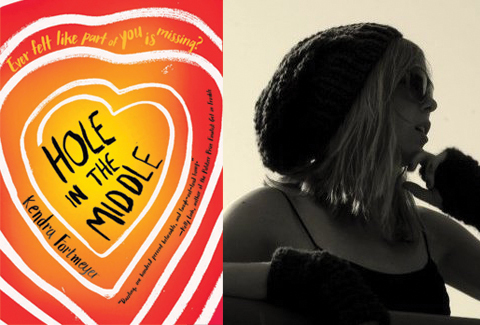 Now imagine everyone else can see the part of you that’s missing – that’s life for the hero of Hole in the Middle, Morgan Stone, a girl born with a hole in the middle of her body. For years, she’s kept her unusual body a secret, and used her sharp tongue to keep other people at a distance. But sometimes, you can’t wait any longer for the world to see you for who you really are. Morgan’s about to face the consequences of being her true self in a world obsessed with instant celebrity, unlikely love stories, and perfect female bodies – and prove that sometimes, your “weird” makes you more kickass than you ever realized. This book began as a voice that wouldn’t shut up. I was lolling on my bedroom floor once after a mediocre date, and this thought popped into my head: This would be so much harder if I had a hole in my middle. I sat up, thinking, What? Many of the non-Hole medical details of the novel come from firsthand experience – when I was 21, my left lung spontaneously collapsed. (Yes, that’s a thing that can happen!) Because I’m stubborn as a wrought iron fence, my then lung collapsed six more times before a very smart lady doctor took me by the shoulders and said STOP IT and convinced me to get a corrective surgery. In the months after, I was struck by the experience of being a young and otherwise healthy person in a hospital setting, which is generally home to the old and very ill and dying – and also the terror and frustration of having health problems that teams of smart doctors can’t figure out, and that doing all the “healthy things” (taking vitamins, exercising, sleeping, eating right) can’t fix. 4. What books or authors influenced you while writing this book? I’m a huge, devoured-everything-in-her-smalltown-library reader nerd kid. I’m grateful to everything I’ve ever read – I think those words are in my DNA forever. This book in particular bears the ghostly fingerprints of the genre-rocking, magical realist short stories of Aimee Bender and the deeply weird and wonderful stories of Miranda July; the state fair freak show scene owes a lot, spiritually, to the vaudeville world of Elizabeth McCracken’s Niagara Falls All Over Again. I also read a great deal of poetry while writing this book, and rhythms and phrases from poems I love and memorized (especially “The Love Song of J. Alfred Prufrock”) are woven throughout. Originally, Morgan had a slightly dopey but good-hearted therapist named Dr. Wallace. He was a pretty major character – she spent a lot of pages on his couch. He was ultimately cut from the book, not because therapy isn’t helpful or important (it is! ), but because he didn’t work from a story perspective – his whole job was to explain to Morgan what she was thinking and feeling, which, as it turns out, makes for a way more boring book than having her figure things out for herself. On that note, though, in real life, Morgan would definitely have a therapist to talk to. We place a lot of fear and shame around mental healthcare (if I go to a therapist, it means something’s wrong with me) that’s frankly silly. You go to a doctor once a year for a check-up. You go the dentist to get your teeth cleaned and your cavities filled. In the same way, going to a doctor to help sort out your thoughts and feelings once in a while makes sense. You wouldn’t be expected to fill your own cavities, would you? GO SEE THE FEELINGS DOCTOR OCCASIONALLY; IT IS HELPFUL AND NOT WRONG, I PROMISE. Powerful, energized, and unafraid to be themselves, no matter what they look or feel or think like, or how other people tell them they’re supposed to look or think or feel. Most of all, I hope readers who have always felt like outcasts (weird, lesser, etc.) feel less alone. You’re brave and amazing and 100% a badass just for surviving this long. Own it. Rock it. And build communities that will help you celebrate it.